Also, if he was indeed in touch with terrorist groups, how was he communicating with them? Complicating the picture is the case of Martin Couture-Rouleau. Couture-Rouleau is a French-Canadian who became a Muslim in 2013. He deliberately hit two Canadian soldiers with his car in St-Jean-sur-Richelieu, Quebec on October 20, 2014. One of the soldiers would later die. Couture-Rouleau would be chased by the police and then gunned down after his hit-and-run attack. Although the fatal hit-and-run murder in St-Jean-sur-Richelieu is a criminal act, it has been presented as terrorism and linked to Canada’s involvement in the fighting in the Middle East. The two attacks respectively in St-Jean-sur-Richelieu and Ottawa have no connection whatsoever, but have been portrayed as part of some coordinated attack plan. The hit-and-run attacks have been added to the narrative of what happened on October 22 to construct the image of an all-out battle. This is part of what sociologists call a moral panic. What exactly motivated the gunman in Ottawa? It appears that Michael Zehaf-Bibeau was not part of some intricate plot against Canada by the so-called Islamic State in Iraq and the Levant (ISIL). He had a criminal record and appeared to be psychologically deteriorating from increasing narcotics usage. He was troubled by hallucinations and heavy drugs, and became a Muslim relatively recently. According to information coming from people who knew him, it appears that he was upset with «the government» for not leaving him alone. This anger could be tied to the social workers and parole officers in his life and a suffocating feeling of being caught in a downward spiral. Michael Zehaf-Bibeau had been staying at the Ottawa Mission, a homeless shelter, between two weeks and a month. Before he went on his rampage, he told other people at the homeless shelter to pray because the world was coming to an end. In this context, it is also important to ask: how a psychologically troubled man staying at the Ottawa Mission homeless shelter could get a weapon? Michael Zehaf-Bibeau, however, has been portrayed to varying degrees as an ISIL member, which is being used to support the narrative that Canadians are under immediate threat from the ISIL by societal actors that sociologists call «moral entrepreneurs». The goals of moral entrepreneurs is to change societal norms, values, laws, and regulations. In this case the moral entrepreneurs want to sell a security agenda. 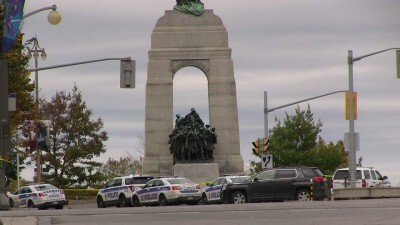 Although the gunman that attacked Parliament Hill was a French-Canadian (with the last name of his Arab-Canadian father — who had adopted him — and his French-Canadian mother’s maiden name) that spent most of his life as a Roman Catholic (starting off as a devout Christian and then falling out of practice over the years), he has been portrayed or framed differently. From the start there was a tacit drive to give him an Arab and Muslim persona. Even when his identity was discovered, his Arab-Canadian father who had adopted him was portrayed as his biological father. The adoption of his father’s Arabic last name was tacitly presented as a marker of his Muslim identity, even though he was a Christian when he adopted the Arabic last name alongside his mother’s maiden name for legal reasons. Very telling was how the media initially described Zehaf-Bibeau. He was referred to as a «Canadian-born man.» This is very deceptive language and discourse that needs to be critically analyzed. When someone is called «Canadian-born» it means that they are not really Canadian, but are merely born in Canada. Referring to a Canadian citizen in these terms conceptually strips them of their Canadian identity and otherizes them as a foreigner that does not belong to the collective. Many Canadians are proud of their media’s reaction and have contrasted it to the sensationalism of US media. Although the media in Canada was much calmer than how the US media would have reacted under similar circumstances if the same incident took place in the United States, it was still emotionally charging the atmosphere with a sense of siege on Ottawa. Headlines and news broadcasts included titles like «Ottawa under attack.» Ottawans were liberally afraid that the ISIL was attacking Canada’s shores. Speculation about a Middle East connection kept being raised throughout the day. By the time that Prime Minister Harper spoke in the evening, it was clear that he wanted to link the events in St-Jean-sur-Richelieu and Ottawa to the Middle East and the terrorism panic to justify his national security agenda. When Harper said that Canada would not be intimidated, it was hollow posturing against an enemy being constructed in the imagination of Canadians. 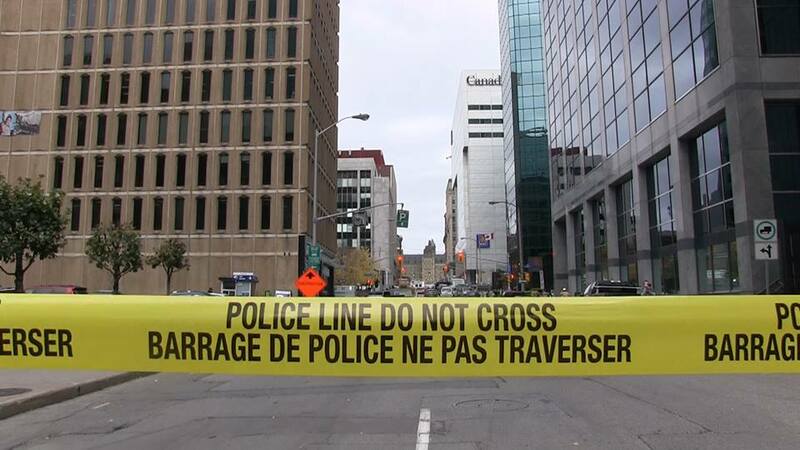 The media coverage, the massive lockdown in Ottawa’s downtown core, and the national measures taken by the federal government created an atmosphere of panic in Ottawa and across Canada. Under this type of atmosphere, people can act unpredictability or abnormally and they are willing to make concessions to the government that they would not normally agree with making. In other words, when societies are gripped by fear many of their members are willing to forfeit their civil liberties and let them be stripped by the authorities. When the Rideau Centre was stormed by three armed robbers in 2003 and half the local police force’s fleet was sent after two of them who had escaped, the same panic did not exist nor did the media give it as much urgency or attention. Arguably the danger to safety was much greater then, even though an important national institution was not being attacked. Legally speaking, Martin Couture-Rouleau and Michael Zehaf-Bibeau are murderers. Instead of treating them as criminals, the politicized and psychologically-charged terms of «terrorism» and «terrorist» are being applied. All the laws to deal with these criminals are in place in Canada, but new legislation is instead being made that also has the potential to be used against legitimate dissenters who oppose government policy. Moreover, the police are being militarized under the new security paradigm of fighting terrorism. The day after the attack on Parliament Hill, on October 23, the severity of the police reaction to a homeless man crossing a yellow police line is testimony to the change in security habitus and tensions among the police in Ottawa. The measures that the Harper Government wants to normalize also include control and censorship over the internet, the unconstitutional and illegal act of taking citizenship away, and removing the mobility rights granted by the Canadian Charter of Right and Freedoms. The last measure has already begun with the confiscation of passports. All Canadians have the right to leave and enter Canada freely, unless they have committed a crime. The government wants to have the legal authority to confiscate passports on mere suspicion without evidence. In the case of Martin Couture-Rouleau, he was detained and had his passport taken away when he wanted to go to Turkey in June or July 2014. The police could not arrest him and had to let him go, because of his views. «We could not arrest someone for having radical thoughts. It’s not a crime in Canada,» RCMP Superintendent Martine Fontaine explained in an October 21, 2014 press conference. The position of the RCMP says a lot about where the Harper Government wants to go with its new security paradigm. It wants the ability to arrest people for their views. Even more dangerous is the flirtation with the idea of revoking citizenship. Already unconstitutional precedents are being set for removing it among the so-called Western coalition of countries that consistently pay lip service to democracy and then stand shoulder to shoulder with dictatorships like Saudi Arabia, Bahrain, Jordan, and Qatar. For example, the British Parliament took steps to remove British-born Asma Al-Assad’s British citizenship in 2012 simply on the account of the fact that she was Syrian President Bashar Al-Assad’s wife. The Canadian legal system does not treat everyone equally and all people are not equal in the court system. Non-citizens are disadvantaged compared to Canadian citizens. In this context, the threat of stripping citizenship away is being viewed instrumentally as a way of circumventing the domestic laws and rights protecting citizens. Without these rights the government can indefinitely detain someone without charge, put them on trial in special security courts where they will not even be told what the evidence against them is, and be prevented from accessing a lawyer. This has been the case of some non-citizens living inside Canada that have been held on security certificates for years. The idea of taking citizenship away is also a political issue being used to politically cater to segments of different societies in various countries that have xenophobic views and dislike certain strata in their societies for various reasons. There is an old saying that society gets all the criminals it deserves. What is meant by this is that many criminals arise out of a structural problem in society. It is no coincidence that Michael Zehaf-Bibeau once asked to be detained to fight his cocaine and crack addiction. Both attackers in St-Jean-sur-Richelieu and Ottawa were drug users and had psychological problems that needed to be helped. In the case of the gunman in Ottawa, he tried reaching out for help and felt a toxic feeling of hopelessness and not belonging. Instead of looking overseas or blaming outside forces, Canada needs to look inside. The roots of the problem include the declining social services of Canada that have progressively faced government cutbacks and austerity measures. By blaming the ISIL and the internet the government is also refusing to acknowledge this failure and the marginalization of many members of Canadian society that are not getting the help they need. There is a call for Canadians to be vigilant against an inflated terrorist threat from the ISIL. This is why Prime Minister Steven Harper and his government are doing their best to portray the events in Canada as an extension of the front in the Middle East. Redefining criminals as terrorists is helping reinforce this perception. Canadians and the citizens of other countries, however, should be vigilant over their rights and freedoms that took centuries of struggle to obtain. Changing the criterion for the granting of citizenship is a whole different topic, but its removal is a dangerous and slippery slope. Although the claims are that these type of measures are for the greater good or public safety, the historic record has shown that the suspension of civil liberties has been used for ulterior motives. As a final note, the same people inflating fears of terrorism in Canada have also supported it overseas. It should never be forgotten that Prime Minister Steven Harper and his cabinet supported the «terrorists» they now claim to oppose. The Harper Government tacitly encouraged Canadians to go fight in places like Libya and Syria for the sake of assisting Washington’s foreign policy of regime change. Canada even armed the militants linked to Al-Qaeda in Libya with drones and weapons in 2011 and allowed private security firms (mercenaries) to assist them. This should not be overlooked when people question how such a state of affairs has arisen. Important details have emerged that strengthen the case against the Harper Government as intellectually dishonest opportunists. Later the article would redact this and be re-edited. This was many hours before Canadians were even told the gunman’s identity or that he was alone. The CBS article would even be edited to remove Zehaf-Bibeau’s name or any mention that the US government was aware of it. Although security can be cited for this, it can also be looked at politically as part of a means of keeping the public in suspense and allowing a state of shock to reverberate across Canada so that the Harper Government can justify its foreign policy and security initiatives. Click here to read a detailed analysis of how the Canadian government has mislead Canadians about the attack on Parliament Hill while it has been blamed itself of supporting terrorists in Iraq and Syria.